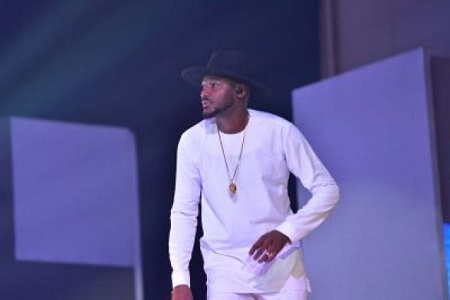 Nigerian singer and music legend, 2Face Idibia was left shocked and embarrassed as just about 50 people turned out for his concert in far away Rwanda. The African star whose tour in the country had earlier been promoted was left flabbergasted as the usual thousands who turn out for his shows were nowhere to be found. He performed almost to an empty hall at the Kigali Serena Hotel on September 23, 2016. The event was 2face Idibia’s second time in the country after his first visit in 2006. Just last month, Wizkid had performed to a huge crowd in the country as many turned out to watch his show. But, no one expected that African legend, 2Face could be subjected to this type of flop. 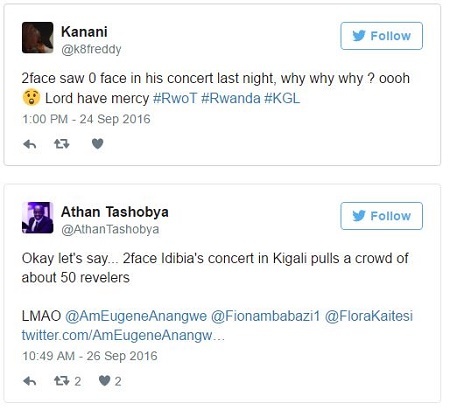 However, Rwandans on social media have revealed why the show was a flop. According to them, the flop was as a result of lack of proper promotion. Again, it was revealed that the concert which was billed for 6pm, started at 10p.m which many believe must have contributed to the flop. According to The Net, 2Face after long hours of negotiation between his management team and the organisers agreed to perform before the less than 50 people at about 11:30 p.m. He is quoted as saying, ‘Hello Kigali. I know you’re very few but we don’t want to talk about whatever happened. I am going to do a unique show for you who managed to come‘. He then went on to perform about five songs including ‘True Love’, ‘If Love Is A Crime’, ‘Blind’, and ‘African Queen’ before his manager, Efe Omorogbe gave him a sign to quit the stage. Rwandans have also blamed the show organisers for the flop saying that the timing of the show was not good. They argued that if the show had come by the end of the month, when workers must have received their salaries, people would have turned out for the show. It is still unclear how 2Face will take this considering that some have suggested that his best days are over and it is time to call it quit.